As much fun as it is to sharpen grayscale images, everybody really wants to sharpen RGB images. Here's a query that does that using the 5x5 Unsharp filter I posted in this thread. The RGB query uses two functions, the processtile function used in the earlier query, plus a new processRGB function that applies processtile to each of the channels (extracted using TileChannel) in turn and concatenating them back together into a three channel tile. This is a simple use of filters, using the same filter for each color channel and not weighting the channels differently when reassembling them. Note that the CREATE TABLE statement has been adjusted to use FLOAT64x3 and float64x3 instead of just plain float64, since now we are using tiles that are three channel. Tomorrow I'll show how to do a two filter Sobel or Prewitt filter, which the use of the two functions, compartmentalizing what's actually done to a tile within the processtile function, makes easy. I'll also post a project that can be downloaded. Above is the original St Peters image in RGB. Above is the image after unsharp sharpening. 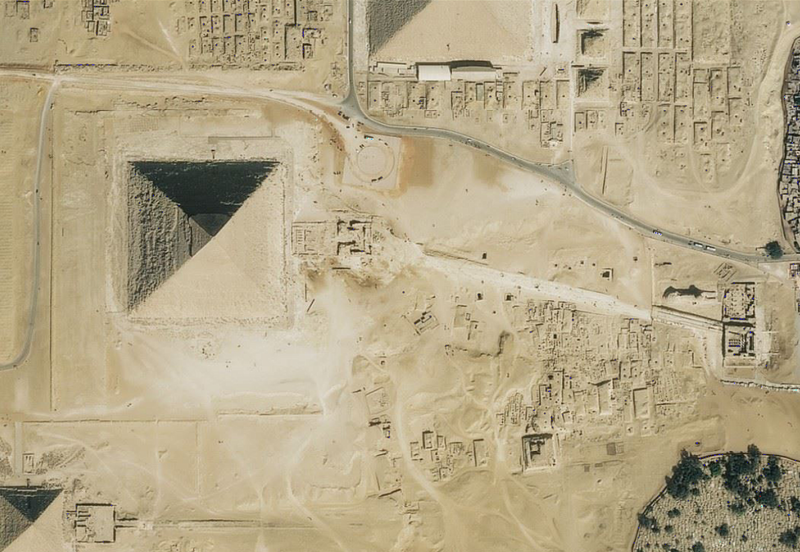 Above is a big image of the Great Pyramid at Giza. Above is the same image after unsharp sharpening. Wow! Impressive improvement. 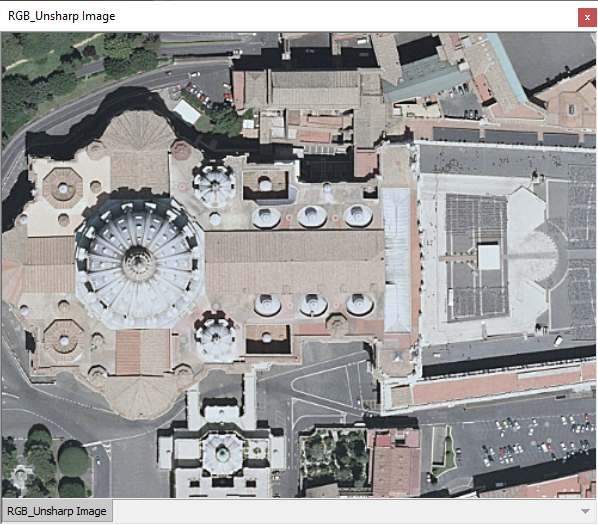 I noticed that the unsharp filter does add color artifacts to some of the distinct features on St. Peter's Basilica. Those artifacts would make the image less usable when zoomed in. However, for large scale images, the results are stunning. The example RGB unsharp filter is a simple example, applying the same 5x5 convolution matrix to all three channels the same way, with no post-processing afterward. That keeps the example simple enough so people can focus on the basics of using convolution filters with three channels. Sites that allow you to apply a filter don't always tell you how they thereafter post-process the result, such as stretching or autocontrasting into a 0 to 255 output range. The example doesn't do any of that, to keep the query as simple as possible. Artifacts occur when sharpening effects cause channels to get out of proportion with each other. That can be restored by applying full range in Style. You then need to apply medium autocontrast. (This particular image needs slightly less than medium, but that won't be an option for a point-and-click dialog until later this year when Manifold goes through a big image cycle and introduces numerous image editing / Photoshop-like controls.) If you do a Full Range and then a medium Autocontrast to the unsharpened St Peters image you eliminate the artifacts. The final result of unsharp after applying Style controls to the channels to first do Full Range and then medium Autocontrast. It's slightly more contrasty than the 5x5 unsplash result in Petrick's page. What you see immediately after applying the unsharp filter, before tinkering with Style. The above is after applying Full Range. No more artifacts, but the image needs contrast adjusted to be brighter and more contrasty. Here is the St Peters image after unsharp, followed by using Style to apply medium Autocontrast. In the other post, I applied Full Range first, to illustrate how the color artifacts arise from out-of-balance scaling, but you don't need to do that. You can simply apply Autocontrast and go straight to that. 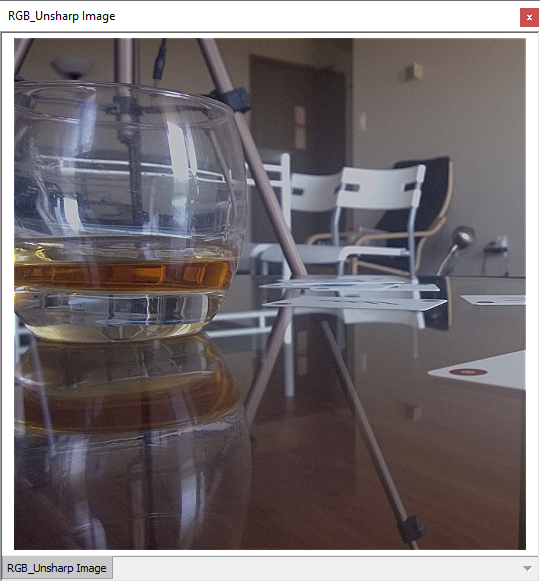 The first image below uses medium Autocontrast, and the second uses 1.5 stdev autocontrast. I used your 5x5 filter on an RGB satellite image which is in a Lambert Conformal Conic projection. When I run your routine on the data set, it comes out as psuedo mercator in the wrong place in the world, when I change the projection to lambert conformal conic it still is not in the right place in the world. There was a series of GDAL errors when I imported that TIFF file and the rest in group of images. The nice thing is that the 2.57 GB RGB image only took ~92-94 seconds with different runs to process with this filter. I'm hoping to be able to use these and other filters at this speed to process imagery if need be and obviously I'd like the images to show up in the correct locations. That's a lot to unpack. 1. Import the image correctly. If this doesn't get done right, all that follows will be done wrong. a. Import the TIFF using Manifold. b. Open it and verify the projection for the image is correct. i. Check what the Component panel of the Content pane reports. ii. create a map. 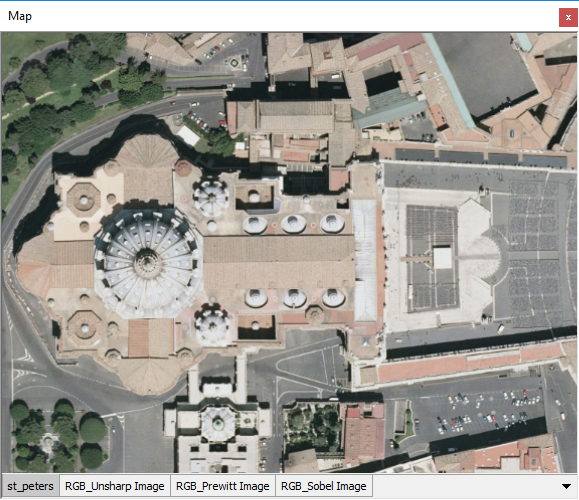 Add a Bing Streets image server layer to the map. iii. add the imported image to the map. Is it in the right place? 2. Adapt the filter to use your image. a. The filter as written doesn't set the projection. You have to use Assign coordinate system to do that, if you want to do it manually. i. open the source image. ii. choose a transform, like Channels. iv. Press Edit Query to see what it writes. In the above, I had opened an image called TerrainDEM that was in cylindrical equidistant projection, I chose Curvature, Profile, and then I pressed Edit Query. The above is the CREATE TABLE part of that query. Note that it adds a FieldCoordSystem.Tile property. Since Manifold wrote it based on what the actual coordinate system of the tile is, we know it is correct. Based on what Edit Query writes, you can adapt the query I posted by using the CREATE TABLE part of what Edit Query creates (adjusting the name of the table created, of course, to match what you use in the rest of the query). It's poor practice to use absurdly large expressions (if the expression is big, better to use a query), but one way to avoid doing infrastructure is to have the Transform panel do the work for you: use an expression in the Expression tab of the Transform panel. I've posted an example in this new thread. Also, we are likely going to add unsharp as a built-in transform. Same for several other things.